Our native grasses still provide the most significant portion of grazing for beef and sheep in northern Australia. So it is worth getting to know something more about these grasses and how they form the cheapest source of cattle feed available. Themeda triandra the name is from Arabic – thaemed (a small quantity of water preserved in a ditch against a time of need) and tri (3) andra (anthers). Kangaroo grass was previously known as Themeda australis, in Australia but it is now known to be the same species as Themeda triandra found in Africa. Kangaroo grass is distributed widely around the world with species found throughout Africa, Madagasgar and Indonesia. The genus Themeda has 16 species worldwide with 3 in Australia. 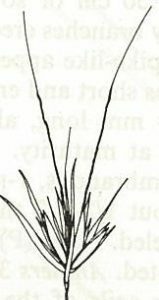 The other species native to Australia are T. avenacea, a tussock grass growing to 2.5m which is common in the Burnett region. T. arguens occurs throughout the northern tropics. An introduced weed species is Themeda quadrivalvis (Grader grass) which is found in many parts of coastal and sub-coastal Queensland including the Burnett, Wide Bay and Moreton; in many parts of northern Northern Territory, including the Katherine and Roper regions. It is most probable that the lush green pastures under large stands of timber commented on by early explorers was kangaroo grass. Lack of fire and overgrazing has caused it to disappear from pastures, especially in the southern states. Kangaroo grass is a common species on all soil types and is one of the most widely distributed grassland and woodland species in Australia. It is a warm season grass that has its main growth in summer and is generally dormant in winter. In the Northern Territory it is found predominantly on fertile red soils in the northern regions. Kangaroo grass is fire tolerant and responds well to regular burning and spelling. It responds quickly to the first rain of the season growing an upright green leaf from the crown of the plant. Being very palatable it is preferentially grazed by cattle and horses when it is green and most sensitive to grazing. In most situations this does not allow it to go to seed and maintain a significant number of plants in the pasture, hence its decline under grazing. It is quite resilient under dry season grazing so wet season spelling may assist the recovery of this species. Black speargrass is more resistant to defoliation than kangaroo grass. This has contributed to its replacement with black speargrass in grazed areas of Queensland and the Northern Territory. In Queensland pure stands are mostly seen on roadsides due to overgrazing of plants elsewhere. The seed heads are produced in large numbers but with only one fertile ‘spikelet’. This has a long, twisting black thread or awn projecting from the cluster. Its awned seeds bury underground making them resistant to fire. Seed is difficult to harvest and is best sown fresh or left for 12 months till dormancy breaks. Kangaroo grass is listed as a likely food source for the caterpillars of some moth species. Aboriginal people gathered the ripening seed in summer across the tableland and high country areas of New South Wales. Grinding stones were then used to produce flour, which was mixed with water and cooked to make damper. Kangaroo grass is a 3P species – Perennial, Palatable and Productive. Careful native pasture burning and spelling can encourage this grass to make a re-appearance and contribute to the quality of the grazing diet. See the difference between Kangaroo grass (Themeda triandra) and Grader grass (Themeda quadrivalvis) in this photo of dried, pressed plants side-by-side (PDF, 441KB).